Householders have been warned that they will be prosecuted if they burn domestic waste in solid fuel heating systems, in a bid to prevent a further deterioration of air quality in Krakow. The end of November saw air pollution rise to dangerous levels in the city, in Tarnów, and in some other towns around Małopolska. Tiny particles of dust containing dioxins, sulfates, nitrates and chlorides gathered over the region, creating a poisonous smog. 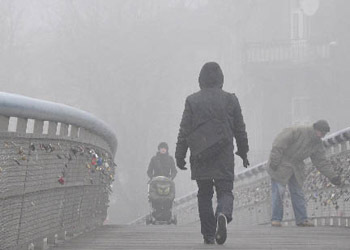 Public health officials were most concerned about the high level of Particulate Matter 10 (PM10), which consists of particles small enough to penetrate the most delicate parts of human lungs. Winds cleared the danger over Krakow during the last weekend of the month, but the previous few days saw pollution reach near emergency levels in the city, and, briefly, surpassing the red alert mark in Nowy Sącz. From November 21 to 25, the concentration of poisons in the air over Krakow reached up to 300 micrograms per cubic metre. The safe level is 50mcg. Such was the level of concern over public health, that some nursery schools in Krakow refused to let children play outside. And city guards have been given special training to help them identify ashes from domestic heating systems where householders are suspected of having burned rubbish. Marek Anioł, spokesman for the city guard, said officers had carried out 160 inspections since the beginning of November – compared to 487 during the whole of the winter 2010–2011 heating season. Mr Anioł added that guards would react quickly to any complaints about burning domestic waste, and said that the Environment Protection Act allowed officers to enter a property in such cases. Across Poland, air pollution is of such great concern that the European Commission has referred the country to the European Court of Justice, asking for fines of up to 323,000 zł. per day until EU regulations about nitrate levels in the air become national law. Poland could also be fined a further 270,000 zł. a day until similar measures are taken to prevent marine pollution.